Abstract: Intermodal freight transport has been proposed as a potential solution for achieving efficient and sustainable transport systems in the hinterland of the Port of Rotterdam. The routing problem arising in container distribution and collection processes is an important issue and similarly the flow assignment problem exists in a more aggregate level. In this paper, we first present the existing literature on routing for intermodal freight transport. Next, an extended intermodal transport network model is formulated for the time-varying and load-dependent travel time on roads. The resulting intermodal freight flow assignment problem becomes a nonlinear and non-convex optimization problem. A sequential linear programming (SLP) approach is proposed for determining the optimal freight flow assignment. Simulation results show the effectiveness of the proposed SLP approach. Reference: L. Li, R.R. Negenborn, B. De Schutter. 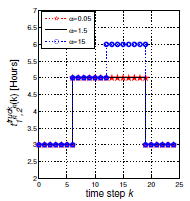 A sequential linear programming approach for flow assignment in intermodal freight transport. In Proceedings of the 16th International IEEE Conference on Intelligent Transportation Systems (IEEE ITSC 2013), The Hague, The Netherlands, pp. 1224-1230, October 2013.